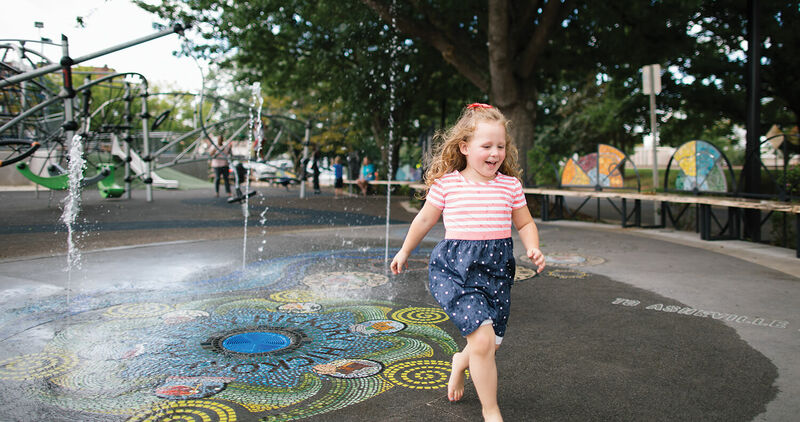 Discover a modern downtown playground that sparks joy and imagination in visitors of every age. Here, kids are encouraged to use their imagination on unique “unrestricted play” equipment. Intrepid climbers can reach the “North Pole” on a giant, Epcot-like geodesic dome filled with rods, ropes, and netting. Explorers can take a tour of the Catawba River by following a twisting, turning map, complete with a splash pad; geography and history lessons; and a compass pointing toward Charlotte, Winston-Salem, and Blowing Rock. Or you can just sit in the shade with a treat from one of the slew of eateries steps away on Union Square, dig your heels into the spongy surface that covers the park, and reflect on how nice it is to know there’ll be no skinned knees or muddy feet, just pink cheeks and lots of giggles.